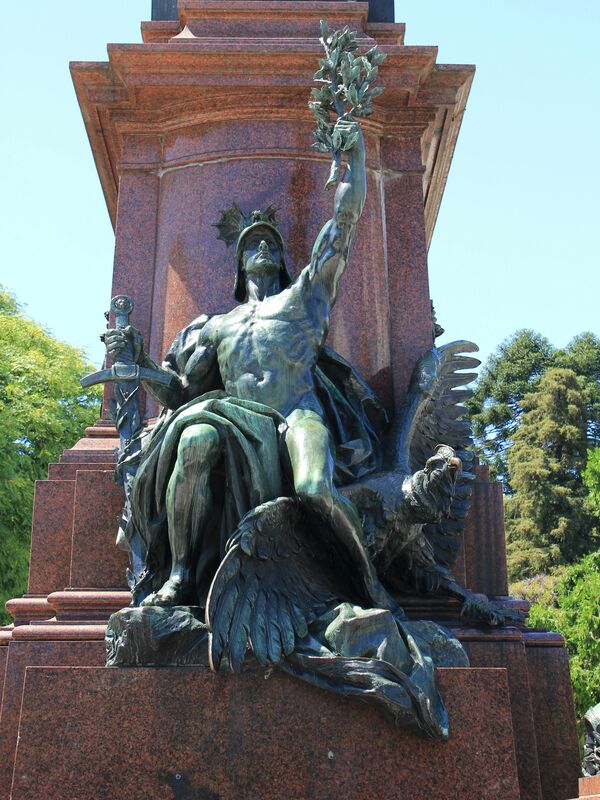 Buenos Aires City Tour takes you to the monument of General Jose de San Martin in Barrio Retiro, presents his short biography, facts and many pictures. Buenos Aires City Tour: Monument of General José de San Martin. Don José de San Martin (1778-1850) was born in Viceroyalty of Rio de la Plata (today Argentina). Most of his early life he spent in Spain where he achieved an exceptional military carrier “polished” during wars against Napoleon and British invasions as well as against Moors in African campaign. Then, something happened in his life, possibly inspired by the successful North American war for independence he decided to renounce the Spanish service and privileges. Subsequently he joined South American revolutionary movements against the Spanish monarchy. Thanks to his enormous military experience as well as his virtues and integrity, he became the victorious commander of the revolutionary army. Working closely with such commanders and political figures like O’Higgins, Simon de Bolivar and generals Mitre, Belgrano and Heras he helped to liberate from the colonial power several South-American provinces later known as Argentina, Chile, Peru, Ecuador.. .
His “lightning-speed” crossing of Andes with few thousands of infantry and artillery troops has been compared to the legendary crossing of the Alps by Carthaginian army under Hannibal’s command. After the final victory over royalists he renounced the political power and career exiling to France where he died in 1850. 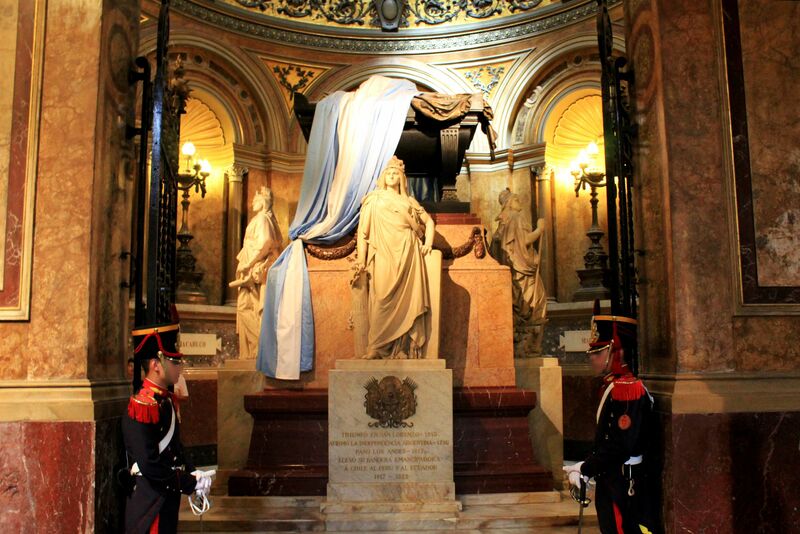 In 1880 his remains were brought from France to Argentina for the final rest in the Buenos Aires’ Cathedral (Plaza del Mayo) with Generals Juan de las Heras and Tomás Guido on his side. General José de San Martin is considered a national hero in most of Latin American countries. And no wonder - monuments glorifying his life and military achievements are dotting the South-American landscapes. The monument on the Plaza San Martin commemorating General José de San Martin is the work of the French sculptor Louis-Joseph Daumas. Erected in 1862 it is the oldest equestrian statue in Argentina. In 20th century the monument was significantly modified by adding a massive red-marble base and five allegoric sculptures – work of the German artist Gustavo Eberlein. Engraved plaques on the sides of the base illustrate the decisive moments from the Independence Wars – crossing Andes, proclamation of the independence for Peru, battle of Salta and the capture of Montevideo (Uruguay). The sculpture of the General on horseback pointing his hand towards Cordilleras (Andes) in a gesture symbolically indicating his path in the fight for independence of South American provinces was preserved in its original form. It is worth to note that the whole weight of the statue is supported only by the horse’s back legs – a remarkable technical achievement at that time. In 1936 Carlos León Thays (son of Charles) designed the esplanade surrounding the monument. The first scene represents the moment of departure for war characterized by enthusiasm of soldier(s) full of hope for future victories and quick return home. The second scene represents heroism and horrors of battlefields. Victory has a price…. The third one epitomizes the final triumph in the fight for the country. The Angel offering the bay-leaf wreath symbolizes the righteousness of the fight for the independence of the Mother Land – here represented by the basket of food feeding soldiers. The fourth scene illustrates the moment of coming back home – victorious but visibly exhausted soldier warmly welcomed by loved one. The last scene in the front of the base symbolizes the triumphant God of War – Mars. His “muscular” leg over the wing of a condor is a sign of victory breaking the Spanish dominance. Broken-wing condor (representing Spanish colonizers) will never again freely fly over the vast areas of South-American countries. Monument of General José de San Martin. Monument of General José de San Martin - Engraved plaques on the sides of the base illustrate the decisive moments from the Independence Wars. This was the first stop during our walking tour around the Plaza San Martin and understandingly we started it from the monument of the South-American Hero - General Jose de San Martin. In front of us are architectural "jewels" of this area - Palacio Anchorena, Basilica of the Blessed Sacrament, Kavanagh Building, English Tower and more....all accompanied by historical facts, legends, and of course many beautiful pictures.